Basements are unnerving places at the best of times. They’re where you keep the things you can’t bring yourself to part with. 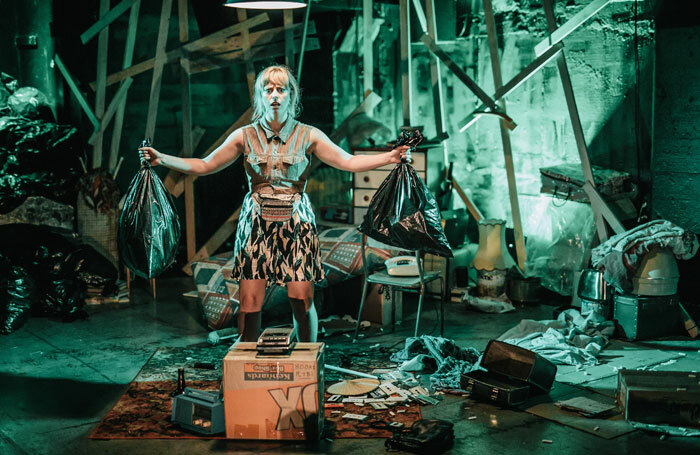 This devised piece from New Zealand sees a young woman (Stella Reid) rooting through her late grandmother’s basement, sorting through her possessions. She’s struck by the similarities between the two of them. She discovers they share a taste in coats, if not a taste in music. Then she finds a series of cassettes and an old tape recorder and it’s here that the piece switches tone, slowly morphing from an exploration of the bond between granddaughter and grandmother into something increasingly uncanny. The girl starts to feel as if her grandmother is speaking to her, as if there’s something she needs her to know.Having lured you in with jokes about vegan pizza, The Basement Tapes shifts gears in the most satisfying and unnerving way. Jane Yonge’s production makes superb use of the basement space at Summerhall, maximising its potential for claustrophobia and intimacy. Designer Oliver Morse captures that sense of a life packed into boxes, the space crowded with old lamps and bicycle parts, a ziggurat of trinkets. The production frequently plunges its audience into darkness. There are a couple of nicely executed scares, alongside a prevailing sense of the eerie. The fact that most of the narrative burden is placed mainly on the tapes, on a voice cracked by age and time, adds to the effect. A haunting and haunted tale.